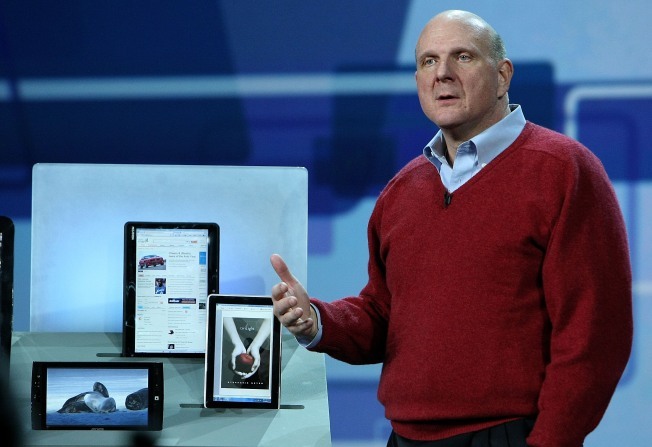 Microsoft CEO Steve Ballmer performance was underwhelming. LAS VEGAS - First the power went out Wednesday night, and when it came back up, Microsoft Corp.Chief Executive Steve Ballmer did little to add to the electricity. Ballmer’s keynote address here the night before the International Consumer Electronics Show opens Thursday morning was highly anticipated after The New York Times quoted unnamed sources as saying Ballmer would announce a radical new tablet computer, which would be developed with Hewlett-Packard Co. The speculation was that it would be the Courier, a miniature Internet device, or MID. Purported images of the Courier created a major buzz when they emerged in September — the Courier would be unlike any other MID on the market, boasting two iPhone-like multi-touch screens in a book-like 7-inch package. In fact, the biggest news from Ballmer’s characteristically energetic presentation was that Project Natal — a module announced last year that will allow players to control the company’s Xbox game system with their bodies — would be released later this year. The news, or lack of it, was an anticlimax for tech enthusiasts as well as journalists spoiling for a Microsoft showdown with Apple Inc., which is expected to announce a tablet computer of its own later this month. Bloggers tracking the presentation in real time derided Microsoft during a power failure onstage, which delayed Ballmer’s presentation for 25 minutes and trashed his plans to demonstrate a PC built into a large-screen television because “it blew the tube,” he said. This year’s CES is an important one for Microsoft, whose year-over-year revenue fell 14 percent in the first quarter of fiscal 2010, with even larger declines in income and earnings. Worse, the company finds itself squeezed on all sides by competitors offering advances in platforms it has long considered its domain. Windows 7, a cleaned-up and streamlined follow-up to its poorly received Vista release, was welcomed when it was released last year, but it wasn’t a major rethinking of a core platform, as Apple’s tablet OS is expected to be. Against it, Google Inc. is working on its own OS, Chrome, which is designed to power netbooks and other Internet-centric machines. The Mozilla Project’s Firefox Web browser, meanwhile, has crept up to claim a quarter of the market from Microsoft’s Internet Explorer. Google’s Web browser, also called Chrome, is making itself heard from, as well, having eclipsed Apple’s Safari to reach third place, albeit with only about 5 percent of the market, in Net Applications’ December browser share survey. Microsoft’s mobile software has run well behind Apple’s platform since the iPhone was released, but in recent months it has also been eclipsed by another Google product, Android, which runs the hottest new smartphones on the market. Android got a rocket boost this week with the announcement of the Nexus One, a Google-branded and -marketed “superphone” that is being positioned as an iPhone killer, with little notice even being taken of Windows Mobile and its long-delayed upgrade. The flexible Android platform will also be running full-power netbooks in direct competition with Windows XP, Vista and 7 machines. Already, major manufacturers like Dell Inc. and Archos are planning tablets running Google’s software. And later this month comes Apple’s slate, which is being characterized as a complete overhaul of the tablet form, exporting something like the iPhone experience to a full-powered miniature Internet device. A new agreement that will make Windows 7 the default OS, MSN the default home page and Bing the default search engine on dozens of new Hewlett-Packard computer lines. Microsoft’s entry into the e-book market with Blio, a free software package boasting deals that will make more than 1 million volumes from major publishers available when it launches. Mediaroom 2.0, an upgrade of the company’s Internet Protocol television platform that Ballmer said would allow users to stream live and on-demand content to televisions, PCs and phones. Ballmer also promised advancements in in-car computer technology products it has created for its partnership with Ford Motor Co. Those were to be announced Thursday morning by Ford Chief Executive Alan Mulally, he said. And even that was undercut somewhat Wednesday when OnStar Corp. announced that its Mobile Experience app for Ford’s Chevrolet-branded electric car, the Volt, would be offered on the iPhone, Motorola’s Android-driven Droid and the Blackberry Storm — with no mention of a Windows Mobile version.